I’ve been talking about them for so long, and now they’re ready for their debut…. 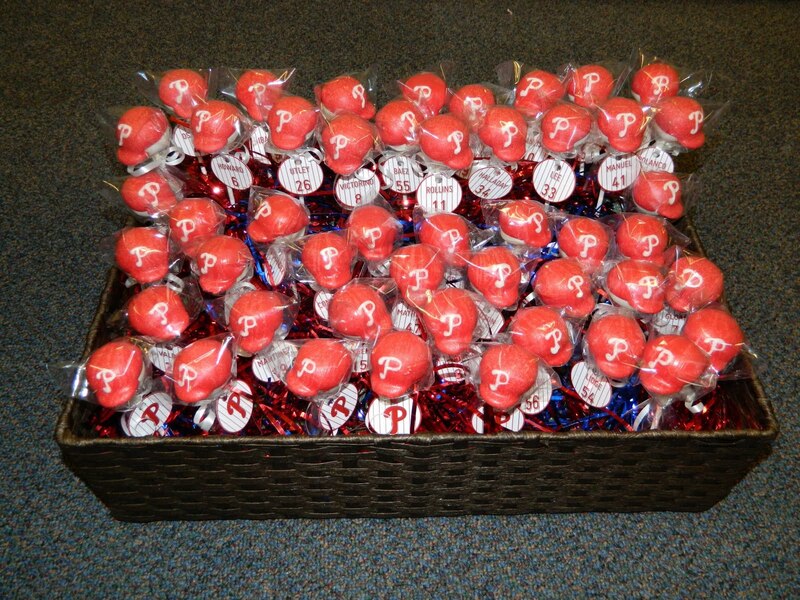 *drumroll*… my Phillies cake pops!!! These pops will be paired up with Phillies Hall of Fame Club Seats tickets and will be up for auction tonight at the Phillies Block Party to benefit Kisses for Kyle. There are 48 pops total, so here’s the breakdown: each player on the 40-man roster is represented, as well as manager Charlie Manuel and the Phillie Phanatic, and six pops with the Phillies “P”. I think these are my favorite cake pop tags I’ve made so far! 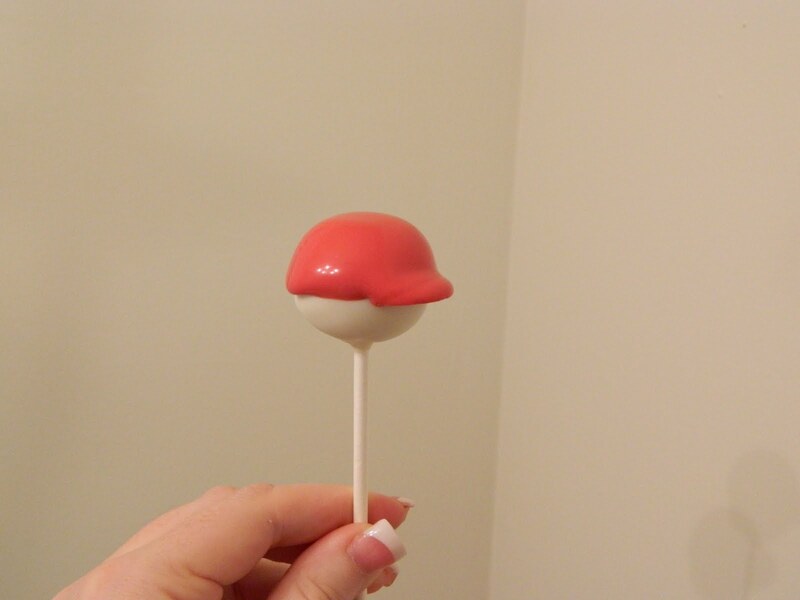 I had so much fun making these, I decided to do a tutorial so you can make your favorite sports-team hat pops too! We are going to make the brim of the hat first, so select whatever color you want your hat to be. 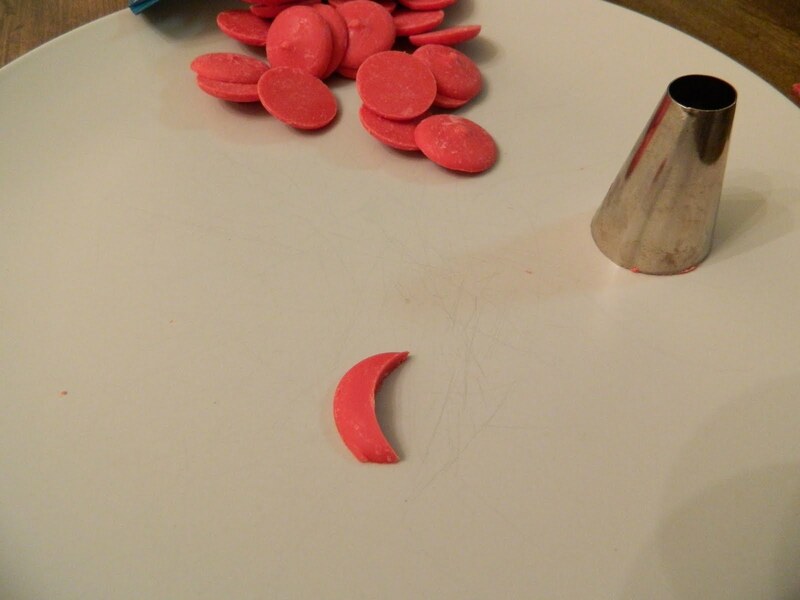 You will need a small round cutter – I used the large end of an icing tip. 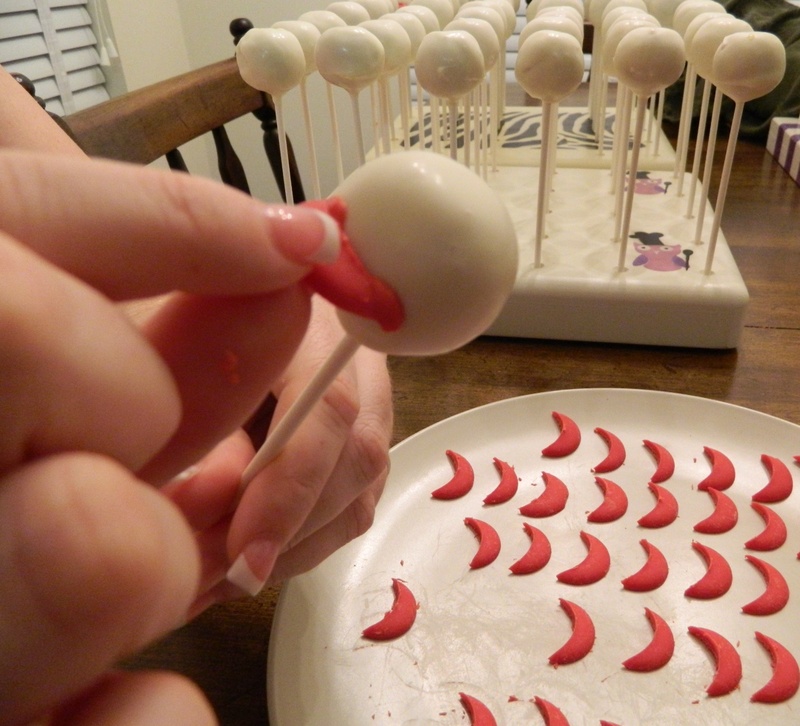 If possible, your circle cutter should be the same diameter as your cake pop, so the curves match up with one another. 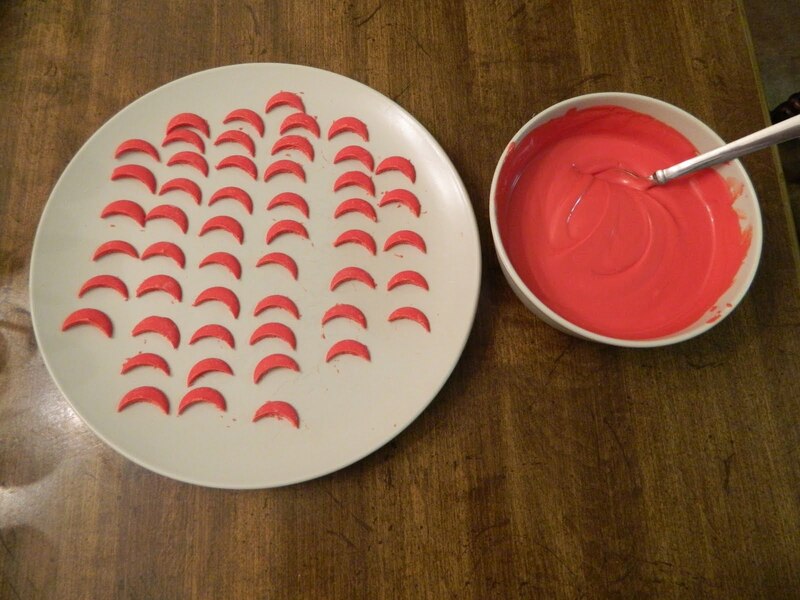 Place your cutter slightly off-center on the candy disc. The larger the amout you leave out, the larger the hat brim will be. It’s up to you how big of a hat brim you’d like. Ta-da! A hat brim! Caution: if your candy is cold, the corners of the brim are likely to break off. If needed, microwave your candy for a few seconds to bring them to room temperature, so that they are firm, but do not fracture when you use your cutter. 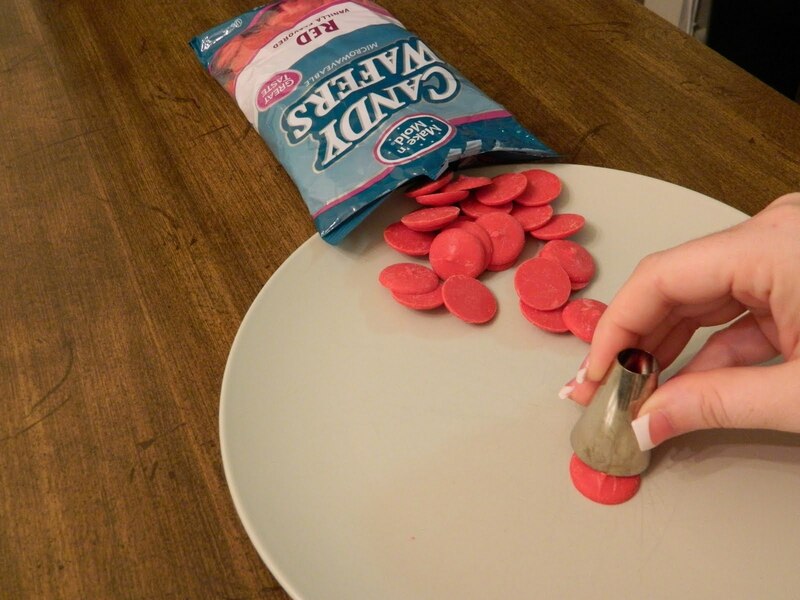 After you have all of your hat brims cut out, you can use the remaining pieces to melt with the rest of your candy. Even though I was making 48 hats, I made 50 hat brims… always good to have extra, just in case. 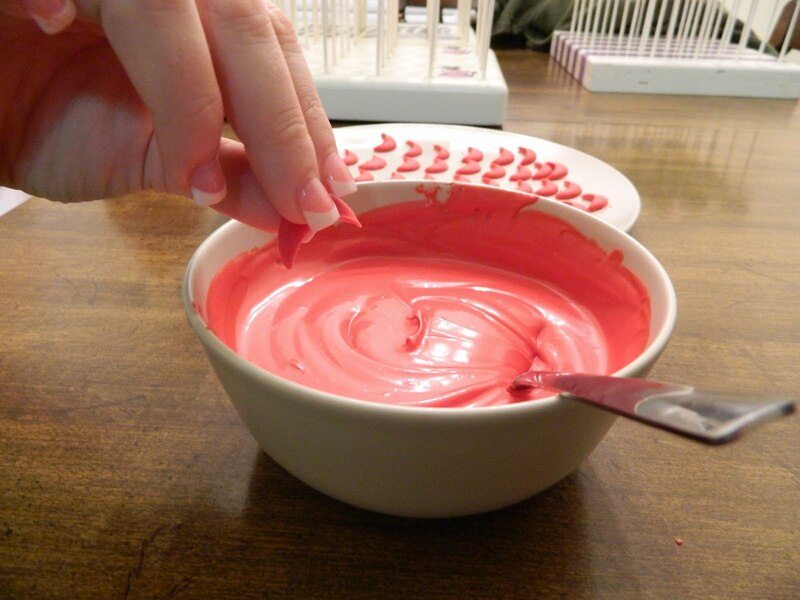 To attach the brim, dip the curved edge in your melted candy…. 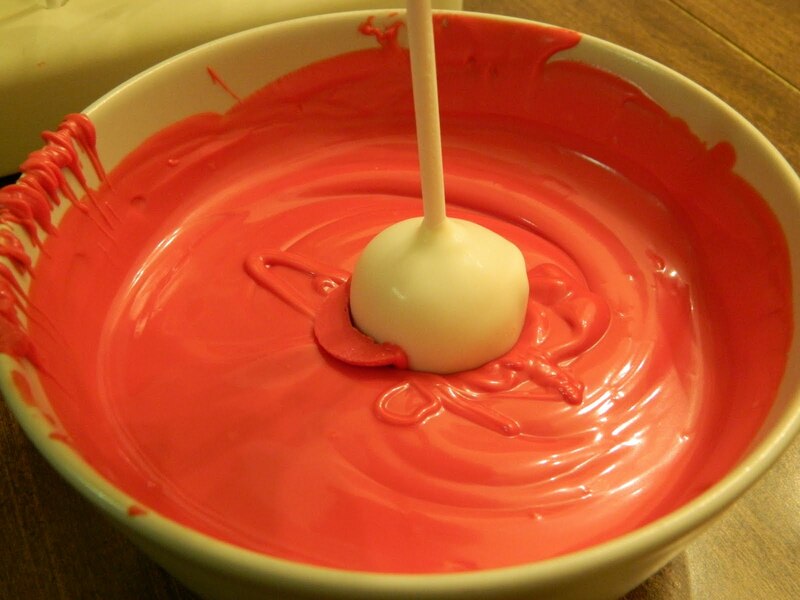 If your cake pop was a globe, attach the brim at the equator mark – does this make sense? 🙂 The halfway point. If the brim is too high, it will limit the space you have to put the hat logo; if it’s too low, it will look like it is sliding off. Caution: do not put too much candy on the brim, or it will take longer for it to adhere, and it’s likely to slide lower as it dries. Voilà! Ok so they really don’t look like much at this point, but you’re almost there. Notice how there are slight gaps between some of the brims and the cake pop? This is because the cake pop is larger in diameter than my cutter. No worries, this won’t cause any problems moving forward – you just need to be gentler with them since they are only attached by the corner of the brim. To create the hat, dip the pop half-way in, no deeper than the brim of the hat. Keep the pop straight up and down – dipping it on an angle will give you an uneven hat line. You may need to rock the pop back-and-forth ever so slightly to get even coverage. Tap the excess chocolate off so that it drips off of the back of the hat – this way the hat looks even in the front, which will be the main focal point of these pops. And there you have it, a red baseball hat! After the pops have dried, you can add your teams logo. I used a toothpick to draw on the Phillies famous “P” logo. Zoom-shot of some of the pops after they were bagged, tagged & put in the arrangement. 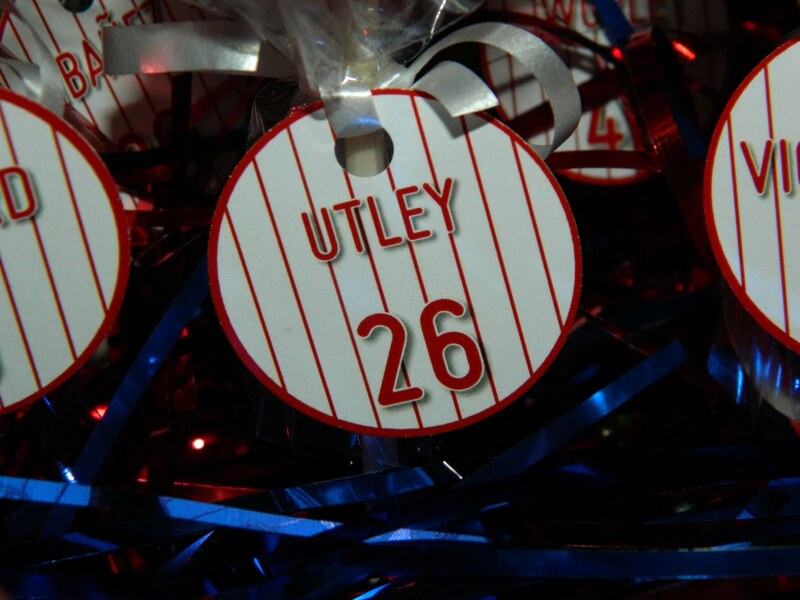 Zoom-shot of the tags – just like the players jerseys! 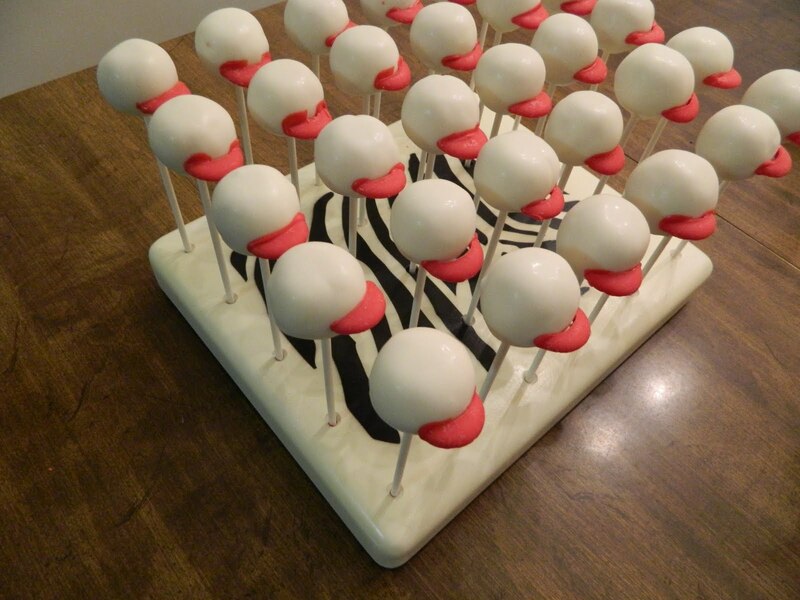 I hope you liked my first cake pop tutorial! If any parts are confusing, or you’d like more clarification on a certain step, please email me at kcbakes@hotmail.com. 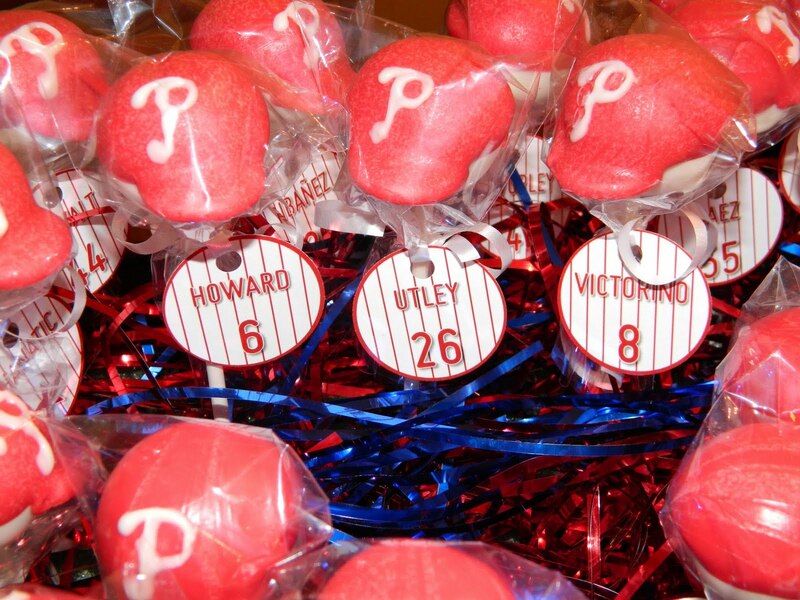 Happy cake poppin’… and Go Phillies! I LOVE these! You did a great job and I sure they will raise a lot of money. I would rather have these than the tickets!!!! Great job! Great job Kim! 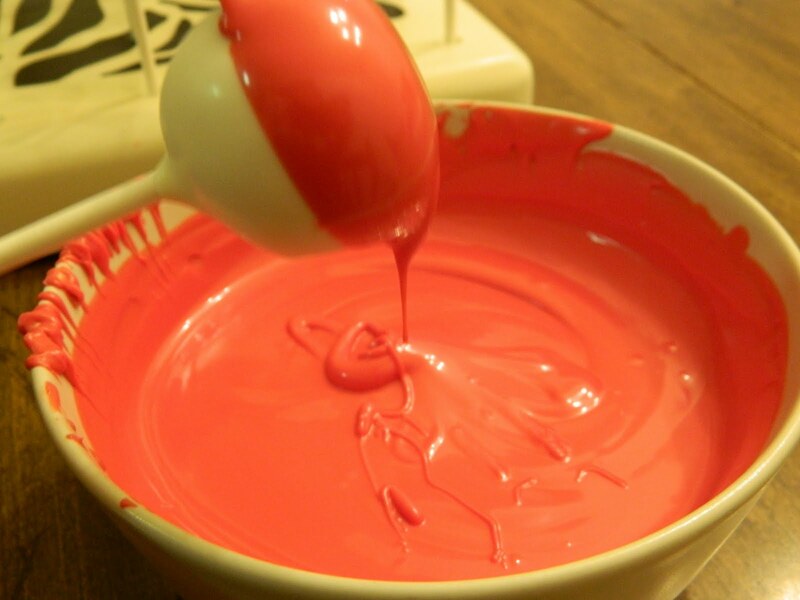 I notice that you use the Make n' Mold brand products. 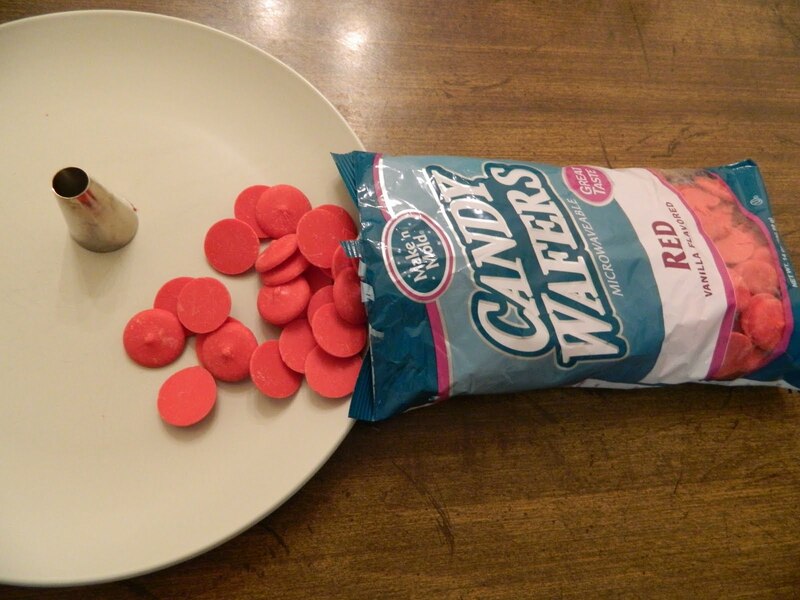 I didn't have very good luck with those candy melts when I tried them once. Any tips or suggestions? I love these hats! Thanks for the tutorial! Thanks for sharing, Kim. I'm always looking for "boy" ideas. Great Job kim!! Thanks for sharing! these are fantastic! 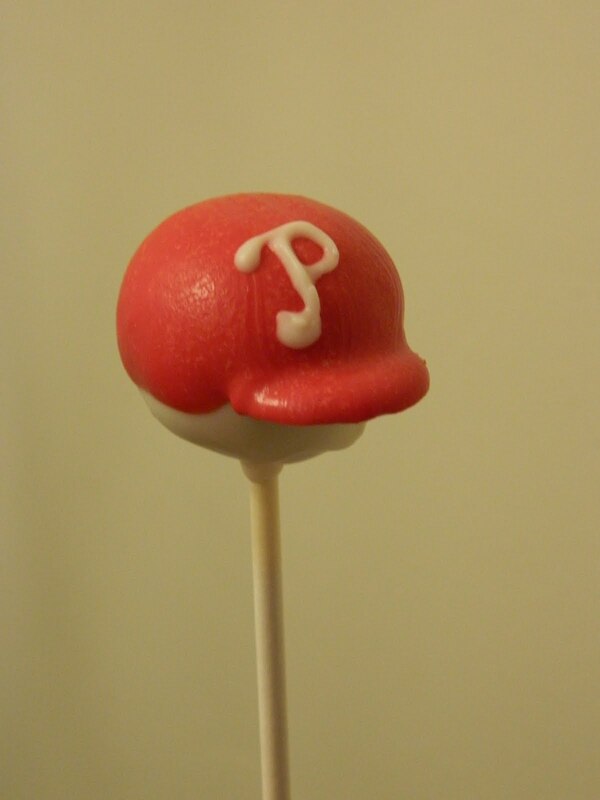 I attempted to do the Phillies logo and failed miserably – I will have to try the toothpick method! How did you create the tags? Kim, I love these! I got your e-mail on the tag tutorial but I am making inviations for my sons birthday party and was wondering if you could give me a few tips on how to re-create the pin strips. Oops, here is the link! Sorry! Thanks so much for linking my post 🙂 Love how you used it to create the hard hats! These are so ridiculously cute! I love them. We are heading full swing into baseball season and these are perfect! Wrong team but I won’t hold that against you 🙂 This is awesome! Thank you for being so creative and sharing! OMG how funny when I used your blog when i first made my Yankee pops not knowing it was YOURS!!! !